Jim Denevan is a chef and an artist. As a chef he is the founder and driving force behind the ‘Outstanding in the Field‘ farm dinners. The aim for the meals is to reconnect the diner to the land, to showcase the talents of the farmers who grow the food and the chefs who prepare it. Here’s a link to the companion book. They were in Boston this week visiting Island Creek Oysters but unfortunately I missed them! As an artist Denevan creates some of the largest drawings on the planet. Working most often with sand on California beaches, but also in other parts of the world including Siberia (! 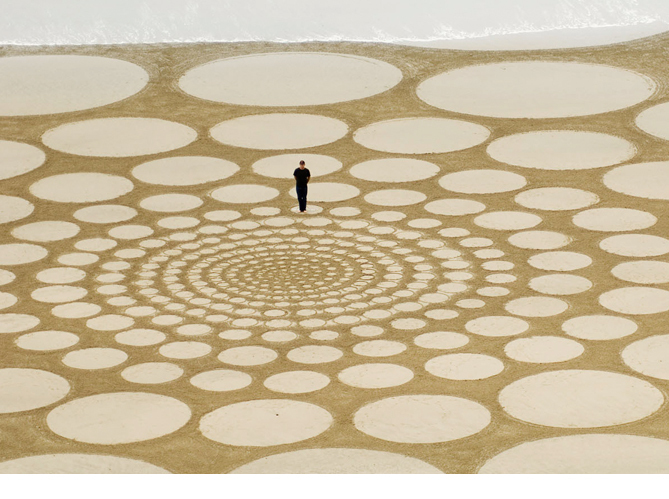 ), working quickly to beat the incoming tide he creates geometric patterns that because of their scale are best viewed from the air. Very impressive. Who ever said that crop circles couldn’t be man made has never seen a Denevan drawing. Check out some videos of Jim at work below. Jim Denevan: Sand Drawings, Spanish Banks from Michael Cox on Vimeo.